Minnesota Democrat Ilhan Omar came out against the anti-Israel Boycott, Divestment, and Sanctions movement during her campaign, but after winning election, she now says she "supports the BDS movement." Omar, a Muslim Somali-American elected last week to replace outgoing Rep. Keith Ellison (D., Minn.) in the House, fought accusations that she held anti-Israel views during her campaign. As part of that effort, she told a group of Jewish voters in the state that she opposed the economic boycott of Israel, calling it "counteractive" and "not helpful in getting that two-state solution." But Omar's tune has changed since winning the election. In an interview published Sunday by MuslimGirl, Omar said she "supports the BDS movement." "Ilhan believes in and supports the BDS movement, and has fought to make sure people’s right to support it isn’t criminalized," her campaign told MuslimGirl, which said Omar had been criticized for coming out against BDS. 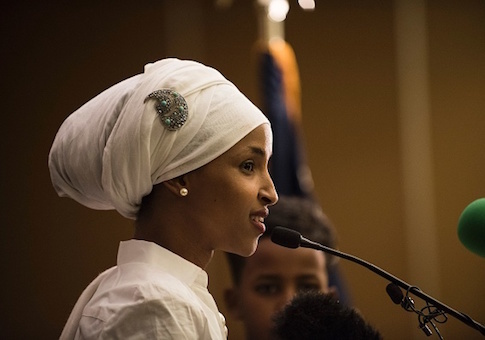 Omar's campaign also pointed MuslimGirl to her vote against an anti-BDS bill in Minnesota's state legislature and her argument that boycott movements were successful in South Africa. The comment is seen as a complete reversal by members of the Jewish community in her district. "She’s either misrepresenting or misunderstanding, and I hope to be able to have a dialogue with her that clarifies which of those is the nature of her stance," Rabbi Avi Olitzky, who hosted the event where Omar came out against BDS, told Forward, a Jewish news outlet. Olitzky added that Omar was starting her "tenure off on the wrong foot." Omar defended her comments in text messages to a local Jewish reporter, saying the moderator "didn’t ask for a yes or no answer" at the initial event. Omar was asked during the debate to state "exactly where you stand" on BDS. "I think we all look for honesty in our candidates," Beth Gendler, executive director of the National Council of Jewish Women-Minnesota, told Forward. "We’re troubled by her support of BDS, and we want to maintain our working relationship with her as a member of Congress." The reversal was celebrated by pro-BDS groups like Jewish Voice for Peace. "I was thrilled to hear that Ilhan Omar supports the BDS movement and that she is committed to making sure that people’s constitutional right to boycott is protected," said a member of the group, a leading organizer of anti-Israel events across the country. Omar's stated views on Israel, which include claims that it had "hypnotized the world" and is an "apartheid regime," led even Democratic groups to condemn her. The Jewish Democratic Council of America declined to endorse Omar during the campaign. "Now that Ms. Omar has emerged as the Democratic candidate, JDCA will not support her candidacy—and certainly will not endorse her—because her views are not aligned with our positions and values," the group said. A Democratic operative told the Free Beacon in August that Omar would have to moderate her views on Israel if she wanted to be accepted by congressional leadership in the party. "Ilhan Omar will either moderate her extreme and dangerous rhetoric or, at least when it comes to Middle East issues, she will be shunned by the Congressional Democratic Caucus and the party as a whole," the Democratic operative said. This entry was posted in Issues and tagged Democratic Party, House Democrats, Ilhan Omar, Israel. Bookmark the permalink.